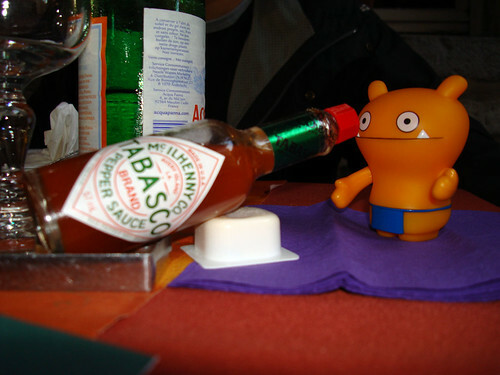 Uglyworld #56 - Wage & The Tabasco Sauce, originally uploaded by www.bazpics.com. For dinner we visited the Italian restaurant Da Tonio in the centre of Leuven. Wage and Jeero were the only two to come into the city with us, as Ox said he had a sore head and would prefer to sleep it off after taking a few headache tablets. Jeero and Wage were up to their normal tom-foolery, in this one Jeero bet Wage he couldn't hold a mouthful of Tabasco Sauce in his mouth for 30 seconds.